Although non-surgical management is the mainstay of treatment for non-insertional Achilles tendinopathy, many patients fail to respond to conservative measures. If symptoms persist after an extended period of conservative management, usually at least six months, surgery should be considered. 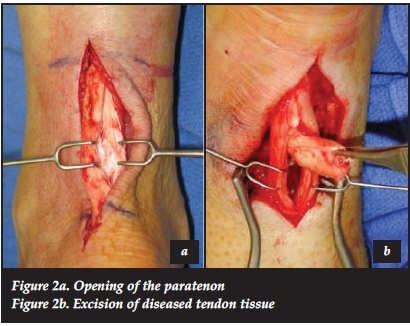 Classically, open surgery was performed with excision of the diseased areas of the tendon. Due to a high rate of complications, as much as 10%, less invasive surgical techniques have been developed and are widely employed with good surgical outcomes and far fewer complications. The reported success rates of open and minimally invasive surgery are comparable and range from 46-100%. Considering the significant morbidity associated with open surgery, minimally invasive surgery is recommended as initial intervention, followed by open surgery if symptoms persist. Tendinopathy of the main body of the Achilles tendon is a common condition affecting both athletes and the sedentary population. The aetiology of this painful condition is largely unknown and exhaustive research has elucidated numerous and complex contributing intrinsic and extrinsic factors. The diagnosis is clinical, although imaging modalities such as MRI and ultrasound are useful in confirming the diagnosis in cases of clinical equipoise. Conservative management, mostly involving an eccentric exercise regimen, is the mainstay of treatment. The various conservative treatment modalities, as well as the aetiology, pathology and diagnosis of Achilles tendinopathy is discussed in Part 1 of this review (see SA Orthopaedic Journal, Spring 2015 Vol 14 No 3). This article will focus exclusively on the surgical treatment of non-insertional Achilles tendinopathy. 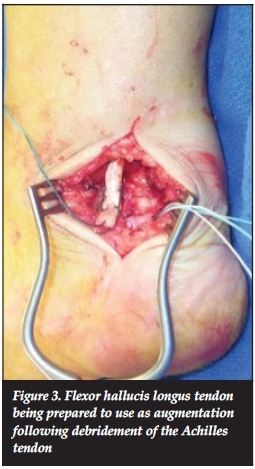 Some 24-45.5% of patients suffering from Achilles tendinopathy will not respond to conservative management and will require surgical intervention.1-6 Surgery should be considered only once conservative means have been exhausted and the patient failed to improve or comply with a supervised rehabilitation programme. The goal of surgery is to modulate the cell-matrix environment in such a way that healing is promoted by improving vascularity and stimulating the remaining viable cells to regenerate.4 This was classically achieved by excision of fibrotic peritendinous adhesions and intratendinous degenerate nodules. More recently, attention has shifted towards disrupting the pathological peritendinous neoneurovas-cularisation that has been shown to be intimately related to the severity of the disease.7 The recent development of minimally invasive techniques has decreased the high complication rates seen with open surgery and shows promising results, although some authors express a concern regarding higher risk for certain complications such as sural nerve damage.8 The rehabilitation period is also much reduced with the use of minimally invasive procedures. 4) The peroneus brevis14 or flexor digitorum5 tendons have also been used as autologous graft to repair and augment the Achilles tendon after debridement. Reported success rates following open surgery of the Achilles tendon range from 46%-100%.4,5,10,15, 16 In a critical review by Talon et al.5assessing 26 published papers, there was a negative correlation between study methodology and good outcomes, which partially explains the discrepancy between the favourable results published in the literature and those which are observed in clinical practice. The concept of gastrocnemius lengthening for the treatment of resistant Achilles tendinopathy was first suggested by Duthon et al.21in 2003. This was based on the premise that a contracted Achilles tendon leads to altered biomechanics in the hindfoot and is a well-known aetio-logical factor for the development of Achilles tendinopathy. They performed a gastrocnemius recession as described by Strayer22 on 17 tendons in 14 patients who demonstrated gastrocnemius contracture pre-operatively, as evidenced by a positive Silfverskiold test.23 All but one patient were satisfied with the outcome of surgery, and 11 of the 14 could return to their previous sporting level. MRI following surgery demonstrated reduction in size and number of hyperintense lesions and tendon thickness, signifying an improvement of the tendinopathy. There were no surgical complications in this series. Kiewiet et al.11performed this procedure for 12 patients with contracted Achilles tendons and chronic tendinopathy. All patients had significantly improved AOFAS hindfoot scores (range 75-100) and only one patient had persistent pain. There were no complications in this series. This technique was first described by Maffulli et al.8in the early 1990s. The patient is positioned prone with the feet hanging over the edge of the operating table. General or local anaesthesia may be used. The area of maximal swelling is identified, and ultrasound may be used if the lesions are not clinically obvious. A stab incision is made in the middle of the tendon with a size 11 blade, cutting edge pointing caudally. The ankle is then moved through a full range of plantar- and dorsiflexion. The blade is then partially extracted and rotated 180 degrees so that the cutting edge points cranially and the ankle is again moved through a full range of plantar- and dorsiflexion. Cadaver studies have shown the resultant longitudinal tenotomy to be approximately 3 cm in length. This procedure is then repeated through stab wounds placed proximally and distally medial and lateral to the original stab wound so that the pattern resembles the number 5 on a die. Post-operatively the patient is allowed full weight bearing with or without a boot and physiotherapy is begun at 2 weeks following surgery. The same group that described this procedure published the outcomes of 63 athletes who underwent percutaneous tenotomy for recalcitrant Achilles tendinopathy. Forty-seven of the patients reported good to excellent results. Nine patients with fair or poor results underwent formal exploration and debridement of the affected tendon 7-12 months after the index operation. Poorer results were associated with pan tendinopathy, multiple steroid injections pre-operatively and poor compliance with the prescribed rehabilitation protocol.25 The authors concluded that percutaneous tenotomy is a good surgical option for resistant Achilles tendinopathy, but patients should be aware that in the case of multinodular disease and extensive paratenon disease, open surgery will be required. Endoscopic surgery for the disorders of the Achilles tendon has been practised since the beginning of the century as an alternative to open surgery, in the hope of reducing c omplications seen with open procedures.27 The goal of Achilles tendoscopy is to release fibrous adhesions around the tendon and paratenon, to strip pathological neovascu-larisation of the ventral surface of the tendon and to release the plantaris tendon.27-28 It has recently been suggested that a thickened, adherent plantaris tendon might be causative, or at least contributory in the development of mid-portion Achilles tendinopathy.29-31 The tendoscopy can be performed through a proximal medial and distal lateral portal, or through two medial portals, using a 2.7 mm scope. Care is taken to avoid damage to the neurovascular structures by staying on the surface of the tendon at all times. The endoscopic release can be combined with longitudinal tenotomies if intratendinous pathology is also present. The mainstay of treatment of Achilles tendinopathy is nonoperative management but for those patients who fail to respond to such measures- surgical treatment remains a feasible option. There have been many promising developments in the field of surgical management for chronic Achilles tendinopathy with encouraging preliminary outcomes. 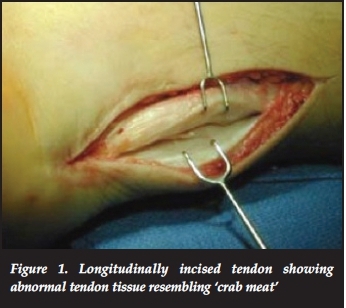 Extensive intratendinous disease requires open surgery with excision of the degenerate intratendinous lesions- and augmentation with tendon transfers if more than 50% of the width of the tendon has been excised. Newer- minimally invasive surgeries- such as percutaneous tenotomies- are effective in treating less extensive disease and pose an attractive alternative to the classic open surgery in terms of complications and accelerated rehabilitation. Current evidence is however limited to small series with short follow-up. Further large prospective studies are needed to define the role of novel surgical techniques in the management of this complex condition. 1. Paavola M, Kannus P, Järvinen TAH et al. Achilles tendinopathy: Current concepts review. J Bone Joint Surg [Am]2002; [ Links ]84-A(11):2062-75. Declaration: The content of this article is the sole work of the authors. No benefits of any form have been or are to be received from a commercial party related directly or indirectly to the subject of this article.